Figure 1: A selection of image cutouts from the DR5 and DR6 Legacy Surveys data illustrating the variety of astronomical objects covered by the surveys and highlighting the capability of the surveys to image low surface brightness features. The horizontal white bar in the lower-right corner of each image corresponds to one arcminute. No image credit. The DESI Legacy Surveys are a collection of three imaging surveys jointly mapping approximately 14,000 square degrees of the extragalactic sky visible from the northern hemisphere. The Legacy Surveys have just published their sixth data release (DR6) which covers ~4000 square degrees, primarily north of declination +32 degrees. The Legacy Surveys DR6 release includes images and catalogs based on z-band data from the Mayall z-band Legacy Survey (MzLS; PI Arjun Dey), r- and g-band data from the Beijing-Arizona Sky Survey (BASS; PIs Xu Zhou and Xiaohui Fan), and mid-infrared photometry from the Wide-Field Infrared Survey Explorer (WISE) satellite for all optically detected sources. The WISE photometry is measured on new coadded images from the WISE mission and its subsequent reactivation as NEOWISE. 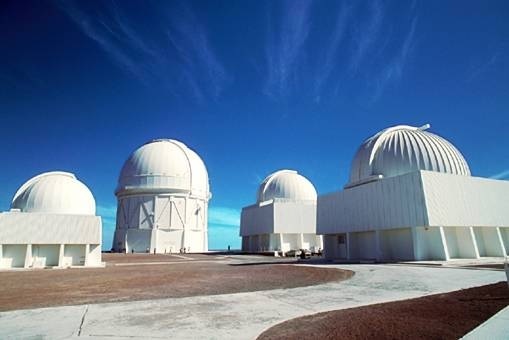 DR6 includes astrometry, photometry and shape parameters for approximately 310 million sources. Combined with DR5, the Legacy Surveys catalogs contain information on roughly 990 million astronomical objects. The primary motivation behind the Legacy Surveys is to providing targeting data for the Dark Energy Spectroscopy Instrument (DESI) surveys. 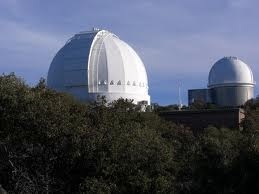 DESI, which is currently being installed at the Mayall 4m telescope at Kitt Peak, will probe the largest volume of the universe to date by compiling distances to 30 million galaxies and quasars, reaching further out than previous work, and providing us with a new 3-D map of the universe. Comparing the observed structures to predictions from cosmological models will tell us about the nature of dark energy, the distribution of dark matter, and the backbone structure of the matter distribution in the universe onto which the galaxies are painted. The ~4000 sq deg footprint covered by the latest DR6 release complements the ~10,000 sq. deg. footprint covered by the DR5 release. The DR5 and DR6 releases overlap in a strip in the north Galactic cap near declination +32 and in some scattered equatorial fields. In addition to a broader footprint and improved depth, the substantially increased overlap with the SDSS/BOSS spectroscopic survey creates exciting opportunities to conduct a variety of astrophysical studies (e.g., galaxy evolution, searching for high-redshift quasars, probing stellar populations, or the discovery of moving objects). The astronomical community is invited to conduct science projects and get in touch with the LS team and/or NOAO Data Lab team as needed. As in previous data releases, DR6 includes images, photometric catalogs, as well as an Image Gallery compiled by LS team member John Moustakas. The DR6 Gallery includes different categories of astronomical objects such as globular clusters, spiral disk galaxies, lenticular or elliptical galaxies (see Figures 1 & 2). Many more beautiful examples can be discovered by exploring interactively in the online sky viewer. We encourage usage of the data from the Legacy Surveys. The DR6 data products are available through:  direct access through the Legacy Survey Team website;  the NOAO Science Archive; and  the NOAO Data Lab. The NOAO Science Archive provides access to both the DR6 raw, and processed images. The NOAO Data Lab provides tools to access databases containing the catalogs. The Data Lab tools enable complex user queries and analyses of the data using a Jupyter Notebook server, a Simple Image Access (SIA) service and a TAP handle (which allows, for example, users to connect to the databases via commonly used tools such as TOPCAT). Example Jupyter Notebooks are also provided to users. We also note opportunities for combined analyses using other datasets accessible through the Data Lab such as the first data release from the Dark Energy Survey (DES), and the NOAO Source Catalog (NSC). The next data release of the Legacy Surveys is planned for July 2018, and will include all DECam data obtained by the survey through March 2018.